Just this week we got another look at Super Mario Maker at a UK press event, and were struck by its significant potential. Yet we've already done a first impressions article from E3, which goes into detail on how well it's shaping up. If you want a strong outline of its core features and why we think it's marvellous, then click that link and have a read. As a game (or app?) it's come a long way since its equivalent demo build of 2014. The level creation tool is fully fleshed out and nicely intuitive; while an overly-swanky PR venue in a hot and sticky London isn't the ideal creative environment, it became clear to your writer that basic levels don't take too long to make. With help from a rep who was clearly a genuine full-on Nintendo fan - she had her Woolly World Yoshi amiibo swinging happily on her key-chain - we managed to see just what it can do. It took no time to set up a sub-world for our level, and the image of Mario crouching down in fear when we tried to 'erase' him - you can't - was both slightly sad and impossibly adorable. This is a game with little touches everywhere, and big Nintendo fans will certainly get plenty of smiles and maybe the occasional chill down the spine as they're found. In any case, as the headline suggests another look at Super Mario Maker brought home one key point in our minds - the Nintendo community could make this a one of the truly great games ever produced by the company. Even with around 100 pre-loaded levels to be included, it's going beyond those pre-sets and into the online stages where this could be a wondrous experience. Now, these comments are largely driven by the levels available in the demo build, which were likely all constructed by the Treehouse team and the core developers in Japan - the variety is wonderful, and most of these stages were shown at some point during E3. From the easiest stage where you quite literally do nothing - just watch madness unfold - to the 'Leap of Faith' which takes a few seconds, right through to lengthy and brutal undertakings; any platforming itch can potentially be scratched. It struck us, when mulling over this potential diversity, that the Nintendo fanbase could be the best thing to happen to a level-creation tool like this. There remains a uniqueness to being a committed Nintendo fan, which matches the peculiarities of the company itself. So much of the love and passion is accentuated by nostalgia and recognising Nintendo's rich history, and in the most recent console generations has also been typified by the fact that the company's output is unique. As we've said many times before Nintendo systems provide their own flavour and vital input to the broader gaming industry - the video game market wouldn't survive with Nintendo alone, but the reverse is also (to an extent) true; Nintendo's weirdness and devotion to colour and personality in its IPs (old and new) is as vital today as it ever has been. The biggest fans of the company surely, to varying and individual degrees, feel this, or at least share perspectives in the same ballpark. Those with a love for Nintendo also share that dedication in so many ways, which brings us the extraordinary culture we see around the company - browsing the web brings up clothes, artwork, animations, soundtracks and so much more that are devoted to celebrating Nintendo. It's that dedication that could bring us truly stunning levels in Super Mario Maker. The creation tool itself has evolved to the stage that, with minimal difficulty, players can create incredibly complex and imaginative stages; the only limitation is how much spare time we have to commit ourselves to the task. Importantly, these levels can go beyond what we see in retail 2D Mario adventures, as we don't need to worry about creating an organic 8 World campaign that is accessible to a range of players. 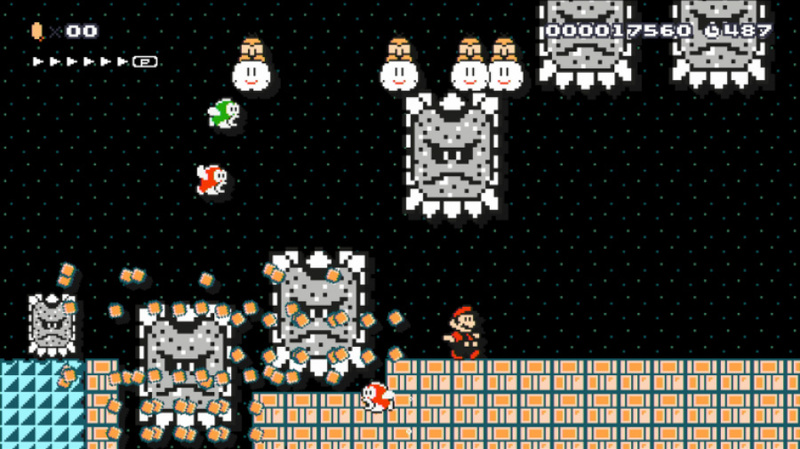 You can create Easy stages that are designed for all to enjoy, of course, and they'll be an important part of the game, but Super Mario Maker will allow players to create the stages they always wanted. When you take all the available items, environments and four classic art styles, and realise they're all paints to go on a blank canvas, eyes widen. It's the potential silliness and mash-ups of items and approaches that promise the most. As was made clear during E3, new sprites and models have been created to broaden the horizons of the four styles - Super Mario Bros., Super Mario Bros. 3, Super Mario World and New Super Mario Bros. U - and open up quirky possibilities. Though a created stage is eventually locked to one final template, the easy swapping while making levels is sure to lead to some wacky stages. While Nintendo's not always stayed true to the approach recently, Super Mario Maker also plays into a sense of generosity. If a stage has an amiibo power-up for a cute 8-bit pixel, you don't need to own that amiibo to experience it in the level; that's a nice bonus. We saw the Bowser amiibo playable character this week, too, and its degree of awesomeness makes us want to experiment with as many amiibo as possible. The user interface for finding levels will be key, too. On a simple level the search tools are intuitive and easy to use, sorting by difficulty settings and checking out key details before diving in. Seeing a percentage of how many people have actually beaten a stage is a nice warm-up, as is the fact you can take a stage you like and edit it yourself, creating a new alternative to share. When running through stages a death shows red crosses where others have met their doom, while Miiverse messages pop up with tips and exclamations of joy / frustration / confusion. All of this helps bring users together. On top of that, the gameplay itself feels as polished as any Mario game before now. With clean, handsome visuals, an impeccable framerate and extremely tight controls, this is as good as 2D Mario has ever felt. Super Mario Maker, then, has all of the tools to be a worthy and brilliant celebration of Super Mario's 30th Anniversary. It's once fans get hold of it and put it to work that it could become the ultimate Mario experience. This is why I am looking forward to playing it. Making and playing amazing levels. This game is the epitome of Hype. I don't think that I've ever really been excited about a Mario game ever before this. Can't wait for all the troll levels i'm going to love those the most. @JakeOfAllTrades Yeah they're usually enjoyable but usually not different enough from one another that you're hyped about it. This one just has so much potential. Day One buy since June 2014. I'm not very creative, so I doubt I'll design many levels. However, it's going to be great fun to try out everyone else's levels. I can't wait to play all of the Kaizo-like levels. As I said before, the Maker series - as I already think of it to be, a series - needs to replace the whole "New Super Mario Bros." series. Or at least, next NSMB titles need an editor in each of 'em. I already have plans for a few puzzle levels. it opens the mario series up to a variety of ways to play. Is this game still coming to the 3DS? As of late I've only seen details of the Wii U version. Okay, I should probably work on designing maps. Need to make sure they're good! I haven't heard any news of a Super Mario Maker Wii U system bundle. It's 30th Anniversary of Super Mario. If they don't do something special, it will be a missed opportunity. @faint Same here, I've heard of people asking for it on the 3DS, but not anything from Nintendo. I will use this game to teach my son how to play Super Mario! BTW, he's 4 and a half. This game will be amazing. One of the best things for me is that you have to actually beat your level in order to publish it online. So there cannot be a challenge posted that is unplayable. If it wasn't SUPER Mario maker, we'd be making levels from the arcade mario Bros.
Glad this is finally happening, always wanted to make Super Mario world levels. Actually tried Lunar Magic before and it just gave me a headache, where it looks like you can create levels in 5 minutes here. Also glad that they included the sub-level. Games like this and Splatoon will at least ensure that the Wii U's appeal will last past when system is abandoned in favor of the NX. I'm super hyped for this. I'm already dreaming of the levels I'm going to create. I really wish they put in a feature to see the whole level pulled back. Or just offer different zoom levels. Working in the window they're giving us might be tough to get the big picture of some of the larger SMW levels. @NintendoFan64 Per Shigeru Miyamoto he designed the original levels on graph paper. I thought there was an article about this before, but wasn't there supposed to be a way of stringing levels together? So you could basically create your own Mario game with back to back levels. Nice write-up. I still see this as a level editor w/o a game, but the 100 levels makes me happy if they are on disc. I'm not a big fan of QR codes and that sort of thing. This review has me the most interested I've been in the game, but now I'm wondering what it would be like for people w/o internet access, or just don't have their Wii U hooked up? I'm pretty sure I've seen a poll on here or an article on the web and I don't think Wii U has 100% online hook-up rate. I've also noticed at least 1 person playing Spaltoon who can't play online b/c of wonky wi-fi. I'm guessing these levels would hardly be of any size though so that shouldn't really be a problem unless they someone tag on online multiplayer at some point. Still not my thing, but I'm more interested now to see what my kids do w/ it. May not be day 1, but probably soon thereafter - my kids birthday is a week later so maybe he'll just save his money and ask for this as a gift. What's a week? 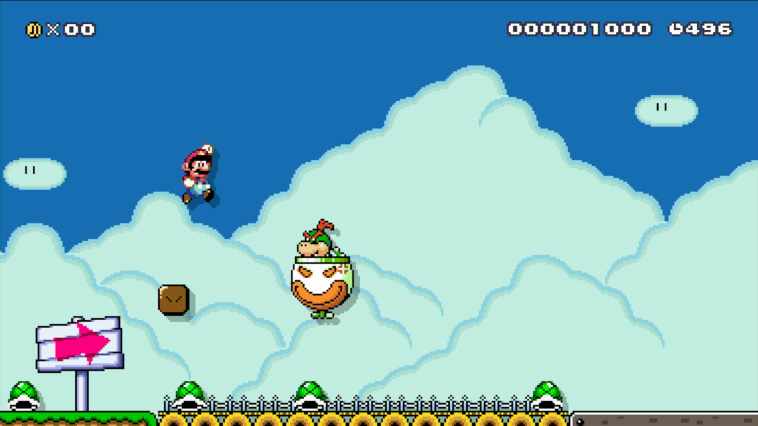 I personally find Super Mario Maker to be disappointing really, because you can't create full adventures/world maps. This also makes 1-up mushrooms pointless. I think I'll just try to get this game used at a cheap price, looks like it's worth about £10. @TwilightAngel Yeah, I really hope Nintendo has curation figured out at launch to weed through the garbage. The more I see about this game, the more I think this could end up being the best game in the entire Wii U library. It could justify the existence of the gamepad all by itself. Why does the Mario Maker banner on this site with the pre-order button take me to sodding GAME's website instead of the official Nintendo UK store? I want to know why, that is NOT on. This game comes with 100 levels? That's almost more than you see in a full retail release. Heck, it is more. I'll be honest- I wasn't that interested in this game at first. Don't get me wrong I was going to buy it just on principle alone- this is a piece of gaming history any collector should own, should one have the desire to craft a Mario level themselves. Which is bound to happen sooner or later. But after the E3 presentation my interest shot through the roof. I'm not really one to create, although I have dabbled in Pushmo World from time to time, but something makes me want to create at least one masterful level- A true piece of work worthy of even Miamoto himself. Fingers crossed for the inclusion of slopes, and SMW half-way markers and Chargin' Chucks. GAH! WHY COULDN'T THIS HAVE BEEN A SUMMER GAME?! Could be outstanding, but if the MvsDK community is any indication, spam, trash kaizo levels are the top rated ones, and smooth, polished levels are neglected and given bad ratings. I hope people just dont get this to play 'challenging' levels, and give a try to the polished, official mario-esque feeling levels. Any word on the 8-bit pixel Mario Amiibo bundle? 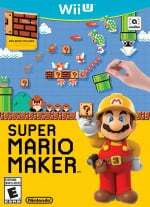 Really looking forward to this, Kaizo Mario Maker here I come! Will there be something like a rating system? So that you can like / dislike certain stages? And maybe be able to sort it with something like newest, most downloaded (this day, week, month, all time) and best rated (this day, week, month, all time)? Because this would make the game much more appealing, awesome and easier to use. @geheimxy it will have a rating for difficulty based on completed/attempted ratio. But giving positive or negative feedback, I'm not sure. Sure would love to hear that it does though. Legacy? A Wii U exclusive won't make much noise if you ask me. It would be a legendary game if it was planned to PC and you could play it from your Wii U, 3DS, Android and iOS devices, all tied to the purchase of one app. As a game concept, I'd say it came literally a decade too late, on the wrong system (which ironically is the most suitable to run it because of gamepad). I'm trying to see the bright side but I can't help, this have high chances to flop as a Wii U exclusive at full retail price. Maybe it's just me, but I'd rather see a full-fledged Mario game (loved 3D World) and not a creation tool. Anyway, I don't think Wii U is going to get more support with NX drawing closer. At this point the only games I'm interested are Xenonlade and Fire Emblem x Megami Tensei. Well, being JRPGs, those two should keep me busy for a while. I love the NSMB series, don't know why it gets so much hate. This is obviously much better, but who's going to buy a new 2D Mario game after this? Oh, and does this game have 2 player co-op like NSMB2? This concept is going to be revolutionary. Imagine the crowdsource level design system extending, in some form, to other games. I'm not saying everyone could create an entire zelda dungeon or level, but everyone could in small parts contribute their patch to a huge world. Mario maker will get that concept rolling. @JaxonH - "Don't get me wrong I was going to buy it just on principle alone"
Yeah, if you didn't buy this game something was going to break in the universe. I really wouldn't even be tempted, but since it's day 1 for the kids I am looking forward to trying it out. Here's my ideal level - big star powered Mario w/ the fireball destroying lots of little bad guys mercilessly until the end. Think Godzilla. I wonder if we'll be able to exchange levels w/ friends, or at least search for them by NNID? Probably, right? Awesome game, will it be available on NX as well? It makes a lot of sense, in my opinion. From what I read on this forum, not many people are artistically inclined to make their own Mario levels... WiiMusic anyone? "...as is the fact you can take a stage you like and edit it yourself, creating a new alternative to share." Actually, the developers have stated that while you will be able to edit stages you have downloaded, you will not be able to share them. Might be getting this.....that is if I get the Wii U. But a bit of concern here, there are only four assets of the game. I can understand 3D Land and World not being done due to them being 3D but what about the Land trilogy? Those games are my most favorite out of all the Super Mario games out there. Also, it could give Gunpei Yokoi some recognition.....just saying. it does look like they're doing a lot of cool stuff with the editor (and new things/dynamics) not seen in the standard games, which can make levels very interesting. The Nintendo fan base tends to be creative so that shouldn't be an issue, they gotta make sure they nail the sharing levels aspect well, so that the amazing creations can be shared/downloaded easily. I haven't followed the news, but I recommend level sharing and the ability for the user/player to group different levels into their own worlds. Also, if you can play 4players (5 with pad? ), that would rock.